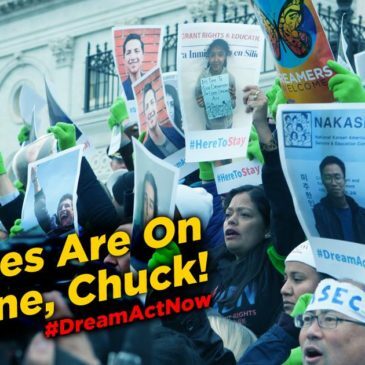 Democrats cave on Dreamers, here’s why it’s bad for the climate. Yesterday Chuck Schumer led Senate Democrats to abandon their bargaining position and re-open the government. For their vote, those Democrats got absolutely zero protections for Dreamers and only a verbal contract (worth the paper it’s printed on) that he’d allow a vote to protect Dreamers before February 8. Let’s be clear: Schumer made a BAD deal. Voters, especially young people and independents, already blamed Trump and the Republicans for the shutdown. And as we explained in our last post, huge majorities of people favor action on DACA (just like they do on climate). Also, as we explained last time, this was a critical litmus test vote for climate change. If we can’t trust Democrats and a handful of Republicans who ​say​ they back a wildly popular policy — in this case protecting nearly 800,000 young people from deportation, but the parallel​ to climate action are clear — ​to stand up and vote that way when given a chance, then we just can’t trust them. And unfortunately that mushy middle where most politicians live has collapsed again. All but 16 hard-line Dream Heroes (not-coincidentally some of our most reliable votes on climate change) voted to re-open the government rather than be tagged as ‘obstructionists. If you’re angry and looking to do something today, I highly recommend the Dreamer Pledge website which lets you check how YOUR Senators voted, and contact them by phone, by emailing their senior staff directly, and by showing up at their offices. The decision to re-open the government was not cut and dry: knowing when to end a shut down action never is. And there are some arguing today that the Democrats did the right thing by voting the way they did. There are more of us, however, arguing that the Democrats caved too soon, not only on Dreamers but on Health Insurance and everything else they supposedly “got” in this deal. It’s doubly disappointing because for once the climate and environmental communities had done a great job of coming together in solidarity, with dozens of groups signing a solidarity letter and showing willingness to show up and shut things down in order to make progress on essential issues like immigration and climate change. Let your Senators know you are willing to shut things down in order to open them up, and that you expect them to do the same. Click here to make a call with the Dreamer pledge team and stay tuned for more updates within 3 weeks. ← Shut. It. Down. Dream Act Now.